Metro Bike Share expanded to Pasadena on July 14, 2017. Photos by Juan Ocampo/Metro. The Los Angeles County Metropolitan Transportation Authority (Metro) and city officials today launched a new bike share system comprising 375 bicycles at 30-plus bike share stations throughout the city. Bike share station locations in Pasadena. Click to see larger. Metro’s contractor, Bicycle Transit Systems, Inc. has completed installation of bike share stations at key locations. All bicycles have been delivered to individual stations and are now available for public use. Those interested in buying a monthly or annual pass for Metro Bikes can register online at www.metro.net/bikeshare. Destinations available via Metro Bike Share include Old Pasadena, the Rose Bowl, Paseo Colorado, Pasadena City College, Caltech, City Hall, the Pasadena Convention Center, the Pasadena Museum of History, shopping and restaurants on South Lake Avenue and many more. Bike Share stations are also available at the Gold Line’s Fillmore, Del Mar, and Memorial Park stations. Monthly passes are $20 for unlimited 30-minute rides. Annual Flex Passes are $40 a year with each ride $1.75. Occasional users can walk-up to the station kiosk and purchase a single 30-minute ride for $3.50 with a credit card. Discounts on bulk passes are also available for employers through Metro’s Bike Share for Business program. Bike sharing is an ideal transportation option for local destinations that may be too far to walk but too short or inconvenient to drive. Metro is working with several cities to strategically place bike share locations near Metro stations to encourage bicycle and transit trips. A single pre-registered Metro TAP fare card can be used to ride Metro Bus and Rail lines and Metro Bike Share system, making the Metro Bike Share system the nation’s most integrated with transit. 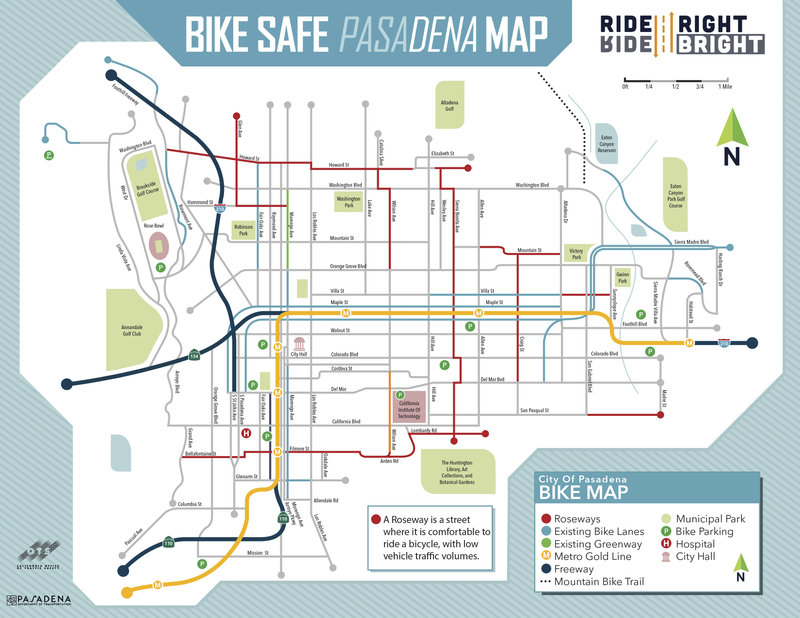 The most recent city of Pasadena bike map. One correct: there are bike lanes on Wilson between California and Cordova. Also, San Pasqual Street is a very comfortable place to ride from San Gabriel Boulevard to Wilson – including a stretch through the Caltech campus. The Pasadena launch is part of a second implementation phase for Metro’s Bike Share Program to expand the bike share network beyond downtown Los Angeles. A total of 60 new stations are planned at the Port of Los Angeles and Venice. The Port of L.A. bike share system is scheduled to open on July 31, and the Venice system will open later this summer. The region’s bike share expansions combined will result in approximately 1,400 bicycles at up to 125 stations. Metro is studying the feasibility of future expansion to more than 20 other parts of the county, including North Hollywood, other cities in the San Gabriel Valley, East Los Angeles/Boyle Heights, Burbank, Glendale, Culver City, Palms and others. Metro seeks to create a regionwide system of more than 4,000 bicycles pending ongoing Metro Board approval. Under the program, Metro splits all costs with participating cities. Metro funds up to 50 percent of the program’s capital costs. It also funds up to 35 percent of operations and maintenance costs. Bicycle Transit Systems will operate the system with bikes and stations provided by BCycle, a unit of Trek Bicycles of Wisconsin. These companies have successfully launched and/or operate more than 40 bike share systems in the United States and abroad. Metro originally launched bike sharing in downtown L.A. in July 2016. That system includes 61 stations and approximately 700 bicycles throughout the downtown area. To date, more than 182,000 trips have been made on the system, with more than 452,000 miles traveled. Nearly 6,000 bike share passes have been sold. Metro’s bike share system has also helped remove more than 430,000 pounds of carbon dioxide — a greenhouse gas that contributes to climate change — from the air. 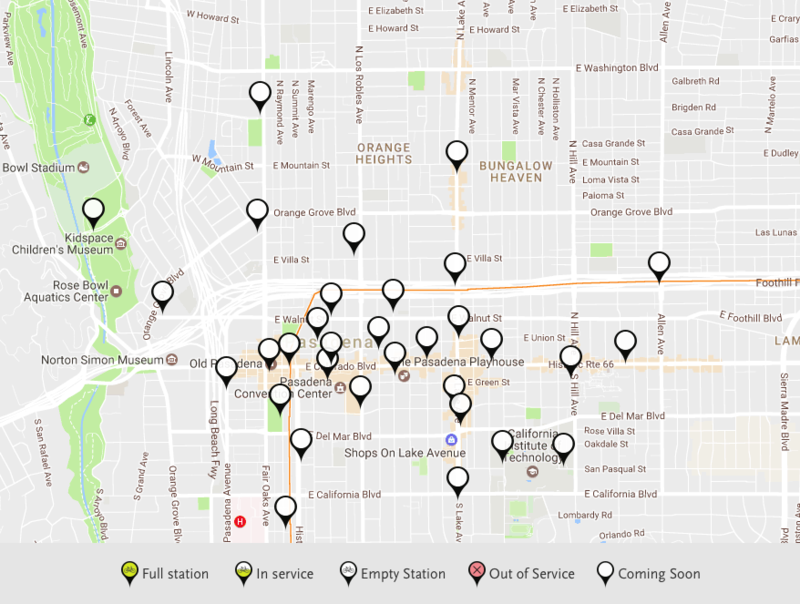 For a map of bike share stations in Pasadena and other existing and planned locations, please visit https://bikeshare.metro.net/stations/. Re your bike map caption, there’s also definitely bike lanes (buffered! with green in conflict zones!) on Halstead between Rosemead and Foothill. It would be nice if they consider other cities in the San Gabriel Valley. For some reason the folks at Metro think the San Gabriel Valley is just Pasadena, Alhambra, and Rosemead.